In Austin, Round Rock, Cedar Park, Georgetown, Hutto, Kyle Buda, Austin, Round Rock, Cedar Park, Georgetown, Hutto, Kyle Buda, Austin, Round Rock, Cedar Park, Georgetown, Hutto, Kyle Buda, Austin, Round Rock, Cedar Park, Georgetown, Hutto, Kyle Buda, Austin, Round Rock, Cedar Park, Georgetown, Hutto, Kyle Buda, Temple, Belton and Harker Heights, this past fall we have had a deluge of rain, cool temperatures and high humidity. These are perfect conditions for fungal development in plants, especially in turf. 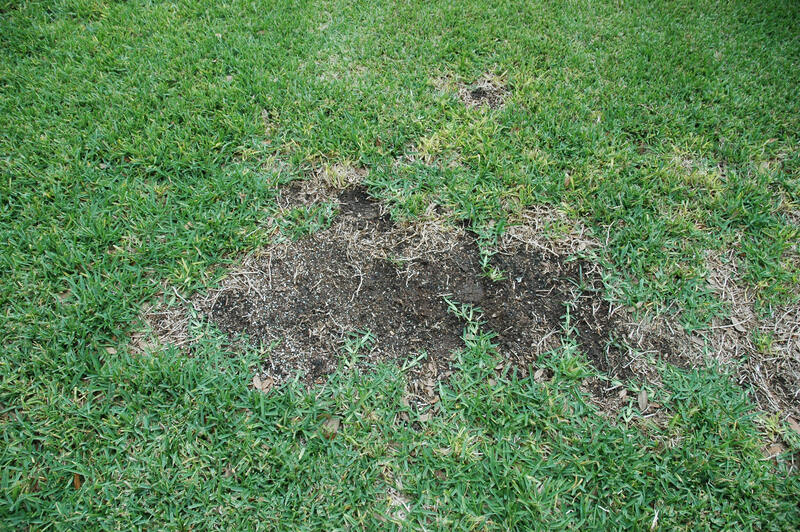 In the past several weeks, homeowners have been inquiring about dead spots appearing in their St. Augustine lawns. Most of the problems have been identified as take-all patch. Take-all patch is a serious root rot disease caused by the soil-borne fungus. It was first discovered on St. Augustine grass in 1991 but has also been found in Bermudagrass, zoysia and centipede grass. Early symptoms appear as chlorosis (yellowing) and thinning turf in circular or irregular patches. The roots are often short, blackened and rotten. The grass stems, or stolons, can often be lifted from the soil due to the poor root system. The yellowing grass blades eventually die and become brown, followed by stolon death. This disease is often misdiagnosed as Rhizoctonia brown patch. 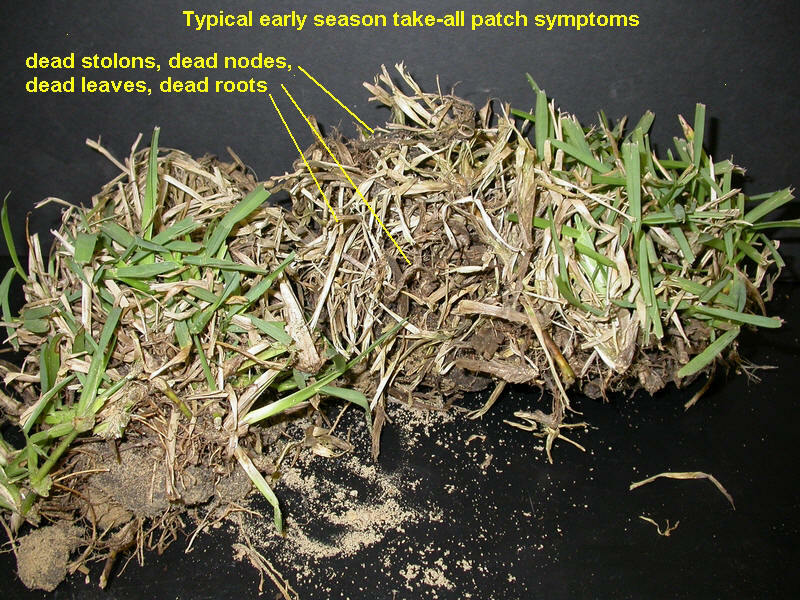 The early symptoms are the same, but the grass blades yellow and can be easily removed from the stolon with a gentle tug. The base of the brown patch infected blade is usually slimy and rotten. The key difference is that the stolons remain green with brown patch allowing the grass to recover in the spring. Grass usually creates a donut look as it regreens. The most effective way to control these diseases is through a combination of both cultural and chemical practices. Good surface and subsurface drainage is important. 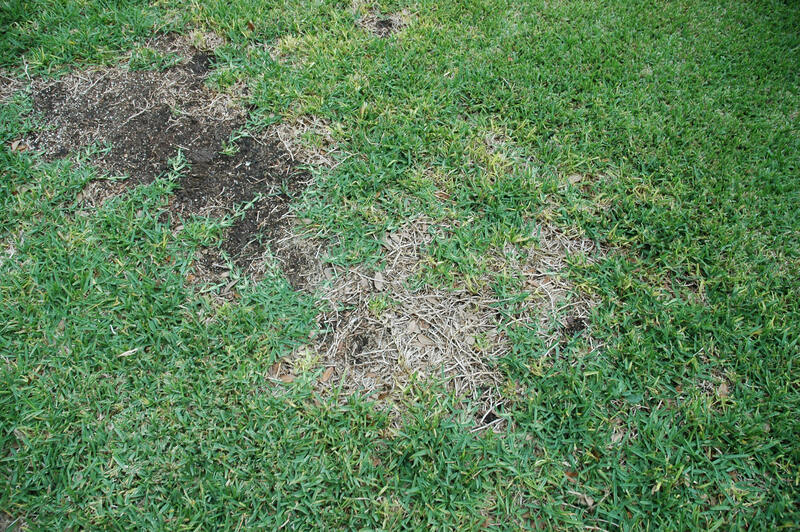 Low areas in lawns that remain under water after heavy rains are highly susceptible to these diseases. Simply changing your irrigation practices can help. A common mistake is to water shallow and frequently. It is better to water infrequently but deeply (6-8 inches) as the turfgrass needs it. Watch your turf; it will tell you when it needs water by becoming dull green in color, and the blades will fold up to reduce water loss. Less frequent watering reduces fungal development and produces a stronger, deeper root system. The turf varieties we use in South central Texas are warm-season grasses and primarily grow from April through October. Your lawn will use less water during the fall and winter months as it goes dormant. Don't expect your grass to stay green and growing from November through February just by watering more. That's the worst thing you can do. If you have an irrigation system, it needs to be reprogrammed to reduce watering for the winter. Also, water early in the morning, allowing the grass to dry before noon. Evening watering increases the humidity and moisture level and encourages fungal root rot. 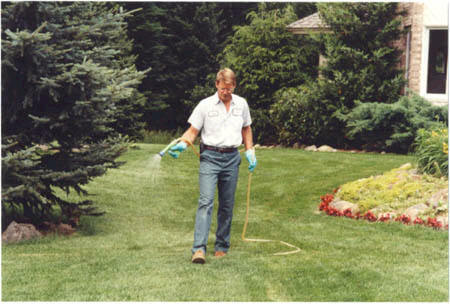 Proper fertilization will keep grass strong and healthy. A fall fertilization with a slow-release nitrogen fertilizer is encouraged. Fertilize with a "winterizer" (50 percent to 70 percent slow release nitrogen) before the middle of November. After fertilizing, water to prevent nitrogen from burning the grass. Never use liquid fertilizers on turf grass, as they cannot control their rate of release. Rake your lawn to remove diseased grass blades and accumulated thatch as soon as you see the early signs of dying grass. This allows for greater air circulation and reduces the humidity at the soil level that promotes fungal growth. It also loosens the soil surface and allows for better penetration of chemicals. 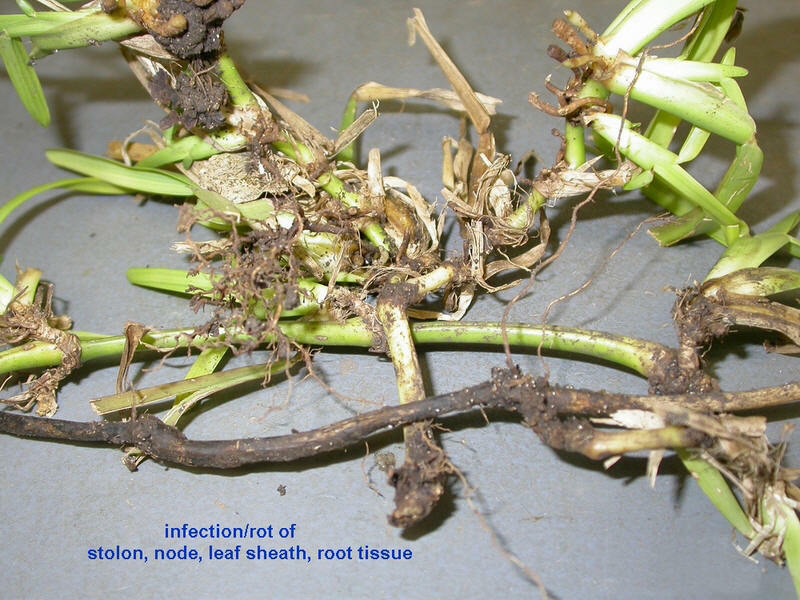 Fungicide applications should be considered where take-all root rot is present. Fall applications as symptoms first appear have proven to slow the fungus. Fungicides that are labeled for control of these diseases or that have shown promise include: Banner Maxx, Heritage, Patchwork, Rubigan A.S., or Twosome Flowable. Waiting until you have large areas of fungal outbreaks is too late to use the fungicide approach for control. Follow directions when applying any chemical. Note that these products should not be applied during high temperatures. Fungicides should be applied in a high volume of water so the fungicide dries on the leaves and can move down into the root zone. Making two or three applications at three-to-four week intervals may also increase effectiveness. Fungicides may or may not be effective; difficult disease to control; use a preventative program in fall and spring; fall applications probably more effective; very important to water fungicides in as deep as you can; replacing the turfgrass without applying a fungicide will only result in the infection of this disease to the new sod.